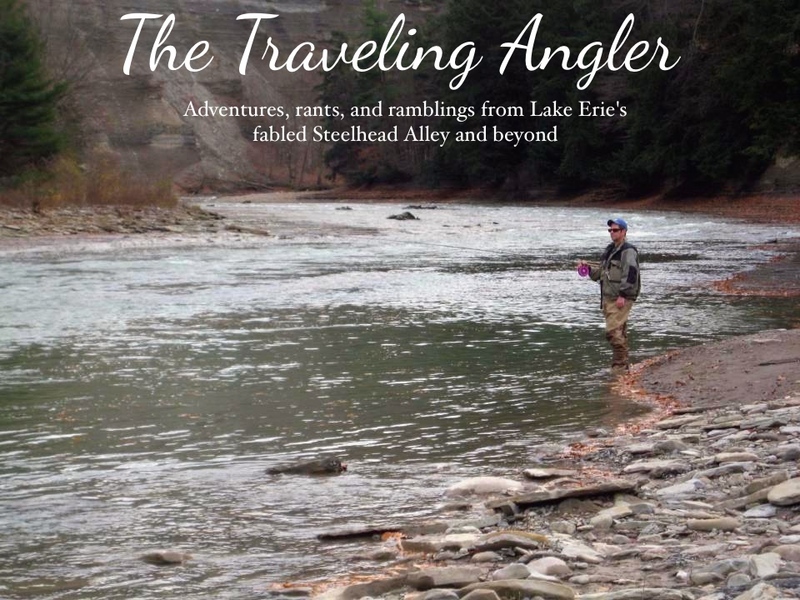 Pennsylvania's steelhead fishery is one of a kind. I liken it to some mad fishery biologist's experiment gone bad. 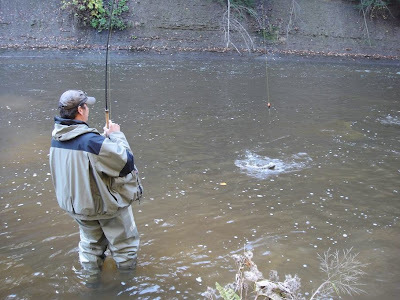 Take over 1 million steelhead and dump them into small streams and ditches. 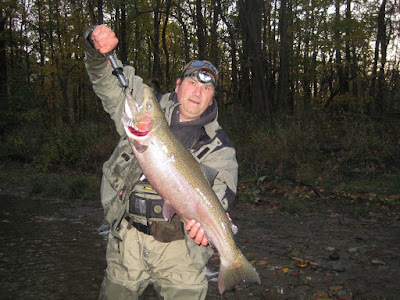 The state stocks the lion share of steelhead into Lake Erie, while Ohio, Michigan, New York and Ontario throw in the rest. In 2008, the Pennsylvania fish and boat commission stock over 1.1 million steelhead into 11 tributaries. 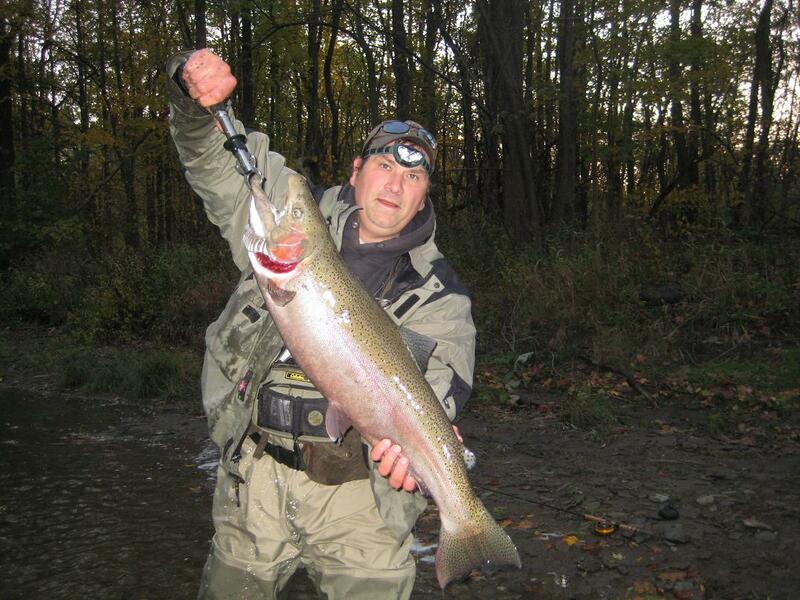 During that same year, Ohio stocked a little over 465,000 steelhead into 5 rivers. If you want big numbers of fish then Pennsylvania is your destination. If you absolutely hate crowds, I would give you about 5 minutes before you lose it. Nearly all of Pennsylvania's streams are very small and all of them run over freestone shale much Ohio's. When ever there is rain or snow melt, the streams can blow out very quickly going from low and clear to a raging torrent. As with all flash floods, the water level can drop very quickly. The window for prime fishing conditions can be brief as within a couple of days, the streams will return to low and clear. Since the shale is light in appearance, darker fish stick out like a sore thumb and some of those fish have no choice but to seek out shelter. Some on the other hand are forced to stick it out and dodge the endless numbers of flies and bait drifted by them. I had a full slate of work on Saturday because I lost 3 days to rain. I wasn't complaining since I was going to make a boat load of money. Later that day, I heard the Elk was on fire because of the stained conditions. When ever their creeks have a hint of mud in it, you be surprised at the low the number of people. Anglers in Pennsylvania love to sight fish. Personally, I can't stand it as I don't find it challenging. Saturday night the plan of action was to fish the Elk. The only concern I had was the river was dropping big time as the flow was at 7 on the gauge. That meant it was running gin clear, but nearly all of Ohio's streams were still too high to fish and I wasn't going to waste a day. I heard that there were hardly any people out Saturday. Sunday it was the opposite as we rolled into the lot before first light. There were about 8 cars ahead of us and I knew it would be a busy day as the weather was beautiful, the creek was lower, and the Steelers were playing a late afternoon game - a perfect recipe for elbows and assholes. I noticed a lot of fellow Buckeyes were here because they had no where else to fish. As we crossed, I looked down and the water was very clear. We continued downstream to one spot that I knew would hold a lot of fish because it was the only deep hole in the entire section. It was first light and we started banging them on small sacs. Unfortunately the ruckus attracted a lot of attention as the vultures started to make their way to the pool. One guy fly fishing below started to inch over as he asked what they were hitting on, I told him small peach sacs. The hole wasn't that big but it was dark and somewhere in that darkness, fish huddled tight against the shale ledge. The fish were on the large size and most looked like they've been in the creek for some time. Dave had his hands full with a large fish, after hauling it in he held it up and it was a dark male with broad shoulders - a beautiful specimen. We worked the pool some more but by then they shut down and we left the others to fight over the scraps. As we walked I found the water too clear for my liking as I'm not terribly keen on fishing water that resembles the clarity of vodka. We decided to go upstream and we could see about 10 anglers clustered around the pool. I can imagine what the fish would be seeing - flies, boots, and hearing a lot of swearing. As expected I started getting antsy because I can't stand crowded conditions. I watched people fishing water a foot deep and it was obvious there wasn't anything there. It just boggles my mind why people do that. I looked upstream and there were people everywhere and I couldn't take it anymore. I had to leave and we decided to jump back across to our yard. We drove farther downstream to see how many people were fishing. Nearly every available parking spot was taken and of course some of the dolts ignored the no parking signs on private property. Some people just love to learn the hard way. As we drove over to Ohio, we stopped at one river and it was still too high. We continued on to the next stream and it was as a perfect as it gets - a nice tea stain with a mellow flow. Even though the small lot was full and a couple of cars parked off the road. We didn't see anybody and one of my favorite spots was vacant. This river has the same characteristics as a Pennsylvania stream - shale bottom with a lot of ledges and cuts. All we did was drift over the dark cuts and that's where the fish were holding. Over the years, I've seen plenty of anglers simply walk by these cuts and chutes because they believe the majority of fish are holding in deeper slowing moving pools. That might be true, but during the warmer months those spots are often pounded mercilessly by the morning crowd. Just in one large cut we managed to hook into over 10 fish. For us, Ohio saved the day and we wondered how our fellow Buckeyes were faring across the border. Satisfied with the results, we drove home and listened to the Browns laying a beating on the Seahawks, the score late in the 3rd quarter was 3-0. What should of been a relaxing evening was cut short when I received a phone call as I was watching the Sunday night game. I answered to hear a women on the other end telling me that she found my wallet. I was caught off guard and had to ask twice. I checked my fleece jacket and there was no wallet. I groaned and it was almost 9:30 but I had to get my wallet as it had all of my important ID including my green card. To make matters worse the lady lived in North Kingsville which is outside of Conneaut. I wasn't in any condition to make the long drive there and back. I filled the coffee mug and drove as fast as I could. I arrived and my wallet was handed over. The first thing I noticed was both my driver licence and green card were missing. She told this was all she found as it was lying on the road near the top of the hill. I thanked her for finding it and making an effort to track me down. It started making sense as I drove out. When I placed my jacket on the roof and removed it, my wallet fell out. When I drove out it flew off and everything fell out. I arrived and it was pitch dark as I parked off the road on top of the hill. It was chilly enough that the crickets could barely chirp. I took out my headlamp and started to scour the side of the road and ditch. I couldn't believe how the lady could of seen it on the road as most people fly up and down it. I gradually walked down the hill painstakingly looking for a small black folder. I continued to look and then off to the side I found it - thank God! Because it would of been a major headache contacting the INS and going through the endless bureaucratic hassle of getting a new card. I also found my Ohio fishing licence and my state applicators licence. I mutter to myself how stupid I was to leave the zipper open, but I breathed a huge sigh of relief that I dodged a bullet. I got back into the Jeep and it was almost 11:30 and it would be another hour before I got home. I was beat and I had to refill the mug at a truck stop. Nothing like industrial strength truck stop coffee and I kept the window open as not to nod off. The last 20 miles were hard as I fought to stay awake, sticking my head out of the window as the blast of cold air reinvigorated my senses. I made it home and basically fell on the bed and I didn't move until the alarm when off at 7:00 starting yet another day. I have done the same thing with miracle results coming from a kind soul. Losing your wallet is a supreme drag!! Nice fish ...hope you guys have a better season then last. You should pack a bag and make a roadtrip to the home land this fall and have us show you where we fish. Didn't see a soul last trip.